My Son, Simon, and me in my Sydney apartment, having breakfast, 1976. Right: Newspaper ad seeking singers for Jesus Christ Superstar. Above: Jesus Christ Superstar's boys chorus, Sydney, Ausralia, 1975. Standing Left to Right: Me, Russell, Ian Broadbent and Adriam Bayne. Seated Left to Right: Gary Young and Jeremy Paul. Right: The program from Jesus Christ Superstar, 1975. 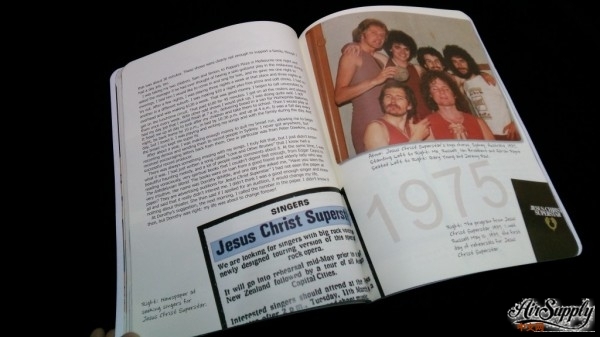 I met Russell May 12, 1975, the first day of rehearsals for Jesus Christ Superstar. 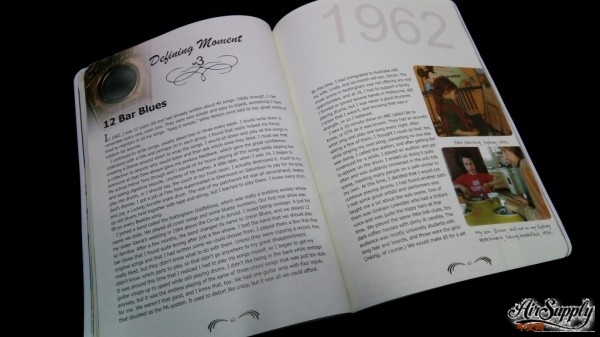 In 1962, I was 12 years old and had already written about 40 songs. Oddly enough, I can remember every one, even now. They were very simple and easy to digest, something I have tried to maintain in all my songs. "Keep it simple," Willie Nelson once said to me, great words of wisdom for anyone. I continued to write songs, usually about two or three every week. I would write them in collections with a title and perhaps 10 in each group. I found that really helped me focus, creating a theme around which to wrap the songs. I would sit down and play all the songs in a collection to anyone who would listen and then ask which ones they liked. I must say that everyone at that time always gave me positive feedback, which gave me great confidence. My school friend Tony Brough and I would sit for hours playing all the songs while shipping tea and eating digestive biscuits, courtesy of his mother. A little later, when I was 14, I began to play the drums, or I should say, the couch in our front room. I actually destroyed it, much to my dad's dismay. I got a job at Fine Fare supermarket in Sherwood on Saturdays to pay for my pride and joy, a Ludwig Acrolite snare drum. The rest of my patchwork kits was all secondhand, beaten up old drums held together with tape and string, but I learned to play them. I knew every drum fill on every Beatles song. I joined a band called the Nottingham Oddfellows, which was really a building society whose name we stole. We played all cover songs and some bluesy numbers. Our first real show was my sister Gloria's wedding in 1964 above the Co-op in Arnold. I loved being onstage; it just felt so familiar. After a few months, the band changed its name to Union Blues, and we played 12 bar blues that I found quite boring after just a few shows. I told the band that we should play original songs and that I had written some we could choose from. I played them a few that they really liked, but they didn't know what to do with them. Unless they were copying a record, they didn't know which parts to play, so that didn't go anywhere to my great disappointment. It was around this time that I realized I had to play my songs myself, so I began to get my guitar chops up to speed while still playing drums. I didn't like being in the back while onstage anyway, but it was the endless playing of the same ol' three-chord songs that was just too stale for me. We weren't that good, and I knew that, too. We had one guitar amp with four inputs that doubled as the PA system. It used to distort like crazy, but it was all we could afford. By this time, I had immigrated to Australia with my wife, Linda, and six-month-old son, Simon. The music scene is Nottingham was not offering any real opportunities, and at 18, I had to support a family. I formed or joined several bands in Melbourne, still playing drums, but I was never a good drummer. I knew that I wasn't, and knowing that was a strength, or so I believed. I saw a 10-minute show on ABC called Get to Know, or GTK as it was known. They had a acoustic artist sing and play one song every night. After seeing a few of them, I thought I could do that, too, while singing my own song; something no one else was doing. I called the station, and after getting the runaround for a while, I played an audition and got to appear on the show. I ended up doing it quite often and was suddenly immersed in the solo folk scene, meeting many people on a path similar to my own. At this time, I decided that I would not continue playing drums. I had found another path. I met some great artists and performers who taught me a lot about the solo scene. One of them was Graham Lowndes who had a brilliant voice and was quite the hippy hero at that time. We played the same little folk clubs, tiny dark coffee housed with dimly lit candle. The audience was mostly university students with long hair and beards, and those were the girls! (Joking, of course.) We would make $5 for a set that was about 30 minutes. These shows were clearly not enough to support a family, though I had a day job, too. I was taking my two children, Sam and Simon, to Poppa's Pizza in Melbourne one night and ask the manager if he had ever thought of having a solo guitarist play in the restaurant during evening. I told him I would like to come in and sing for him, and he gave me one night to try out. After a few nights, I was playing three nights a week at that place and three nights at another in a different suburb. I was making $20 a night plus free pizza and soft drinks. I had no get on the lunchtime circuit. That paid $100 for 45 minutes. I got on all the rosters and played them once every week. With other odd shows I would pick up, I was doing quite well. I still had my day job that I would finish at 7 a.m., delivering bread in a van for Homepride Bakeries. It freed me up all day to look after my children and take them to school. Then I would play at night, be back home by 10 p.m., in bed by 10:30 p.m. and up at 4 a.m. It was a full day every day, but I loved it. I was playing and writing my songs and with the family during the day. And the bread run kept me super fit. After about a year, I was making enough money to quit my bread run, allow me to begin recording demos and sending them to record people in Sydney. I never got anywhere, but received encouraging letters back from them. One in particluar was from Peter Dawkins, a then-successful record producer. There was always something missing with my songs. I truly felt that, but I just didn't know what it was. I had just written a song called "Love and Other Burises" that I knew had a beautiful haunting melody, and a lot of people made comments about it. At the same time, I was reading voraciously, very spirtual books that I couldn't digest fast enought, from Edgar Cayce to The Antideluvian World. The book were on loan from a good friend and elderly lady who was very intuitive. Her name was Dorothy Whittle, and one day she asked me, "Have you seen the paper? They are advertising auditions for Jesus Christ Superstar." I had not seen the paper at all and said that it really didn't interest me. I didn't think I was a good enough singer and knew nothing about theater. She then said if I applied for an audition, it would change my life. At Dorothy's suggestion, the next morning, I called the number in the paper. I didn't know it then, but Dorothy was right: my life was about to change forever!